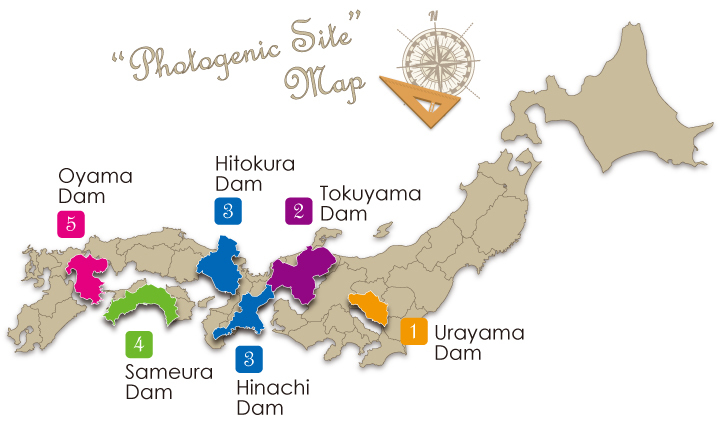 This new "Map Series" features the local sight-seeing spots, local delicacies, souvenir items, or other things attractive among various interesting things related to near-by dams, canals and the like managed by the Japan Water Agency. By selective theme, the Map Series will be presented to you. This is the first issue of the Map Series. The first theme is "Photogenic". 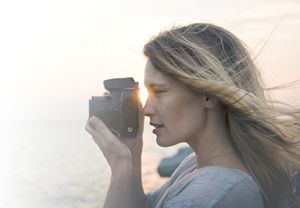 When you place your attention not only on just the object’s beauty or charming point, but also on the total shooting scene, time factor of the day, etc., you can get more attractive pictures. Nowadays among youngsters in Japan, what we call the "photogenic scene on the instagram" has been drawing a special attention and such a photo is called a "Insta-genic" photo. So, would you like to find such a photogenic scene among the dams and reservoirs of Japan Water Agency? You may find "dam-genic" photo world out of them. Please follow the guidance and instructions of the staff when you are in the facilities managed by Japan Water Agency. Please do not enter into the off-limit area. Please refrain from taking photos on the street/roadway to prevent an accident from occurring due to approaching vehicles. Please park your car at the parking lot when you come to the site by car. When you use a drone or similar unmanned flight at the site, please make sure to observe the Aviation Law or other relative rules and/or regulations and also obtain the use approval from the facility management body. Urayama Dam / Saitama Pref. Tokuyama Dam / Gifu Pref. Hitokura Dam / Hyogo Pref. // Hinachi Dam / Mie Pref. Sameura Dam / Kochi Pref. Oyama Dam / Oita Pref. By clicking the each point, you can reach the linked destination page. 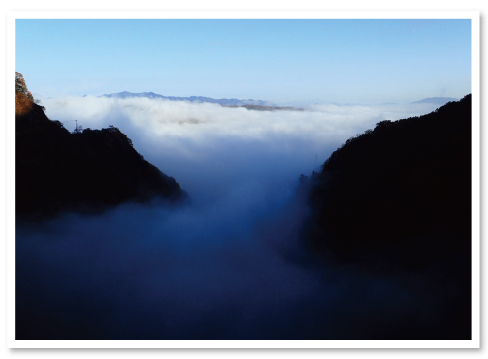 "The scene of a monochrome landscape painting on the sea of clouds"
The picture gives the photogenic sea of clouds, just like a monochrome landscape painting. This is the famous spot in Chichibu region of Saitama Prefecture. You cannot expect to see such a scene all the time when you come to the site. So when you encounter the scene, you will be enchanted. There is a warm and dry atmospheric layer in the high sky. 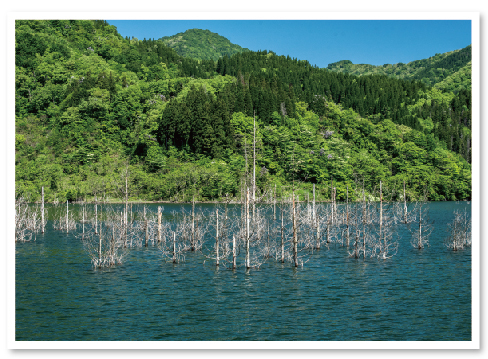 "Fresh greens surrounding Tokuyama Reservoir"
Tokuyama Dam has the biggest gross water storage capacity of 0.66 billion m³ in Japan. And abundant nature is still left untouched there. When the very severe winter comes to an end, all the surrounding trees of the reservoir starts greening, the living birds begin singing and beautiful landscape spreads right in front of your eyes just as if the reservoir is the natural environment. Ibigawa Town's municipal government provides a boat cruise twice a month from May through October every year to let the viewers enjoy beautiful natural environment on board. From the boat on the reservoir at the time of Tokuyama Dam Lake natural Environment Observation Day (held by Ibigawa Town). 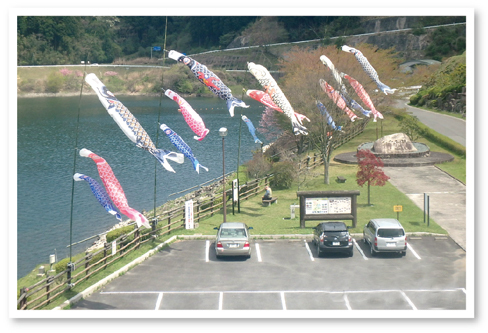 "The dams where colorful carp streamers swimming in the gentle breeze"
At Hitokura Dam and Hinachi Dam, you can watch lots of flying carps, i.e. 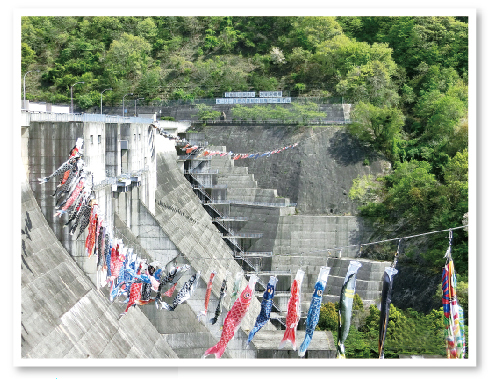 carp-shaped banners in red, blue and black combination swim in the gentle breeze as shown on the photo of Hinachi Dam. A few weeks prior to the above scene, another enchanting opportunities you can experience, i.e. the observation of cherry blossoms in bloom with discharge of water from the valve at Hitokura Dam. At Hinachi Dam, you can stroll around under the cherry blossom trees in gloom at the water park downstream. Please don't miss your visit to many beautiful spots at the dams. 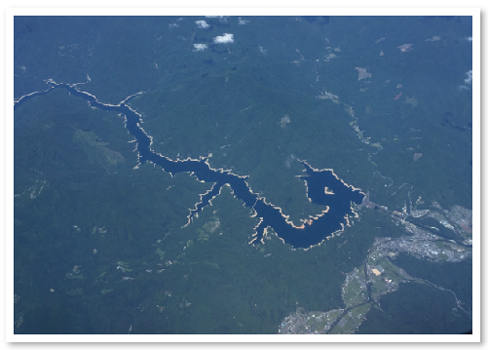 "Try your luck flying over Sameura Dam Reservoir to find a dragon's emergence"
Sameura Dam instantly became famous when the Rakugo story teller and Manga artist Kaminarimon Chicago tweeted about the emergence of a dragon at the Sameura Dam reservoir. When you watch the reservoir from the plane window above the reservoir, you will find a huge dragon from above the lake. Frankly speaking, you will have to have your luck to meet with all of the conditions below i.e. it is a fine day, the water level of the reservoir is adequate enough, and right at the time when the plane is flying above Sameura Dam reservoir. "Shedding luster through the crest spillway gate!" 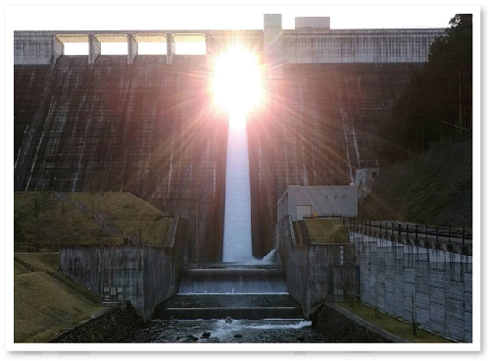 The crest spillway of Oyama Dam is equipped with the gate, or a hole on the dam body so that when the storage water level comes to a certain height, the stored water automatically starts being discharged. So when the sun's orbit comes lowest and closest to the horizon, when a little before or after the winter solstice, the setting sun sheds luster through that hole, or the opening crest spillway gate. Such a chance is quite limited to a certain short period and the weather has to be fine. Otherwise, you will have to wait for another year. That's why the level of difficulty is set to be a little higher.